Try this festive and easy appetizer that features the vibrant, tasty pomegranate seeds. The tartness from the pomegranate complemented the sweetness from the honey, the nuttiness form the pistachios and the creaminess from the brie cheese. The seeds can be a little tedious to remove, but engage your family to help you. I think it is a wonderful way to teach children about the variety of food available. Remove rind from brie and cut into pieces for easier and uniformed melting. Place into a small to medium sized baking dish. Top with chopped pistachios. Evenly and generously drizzle honey over the top. Set aside. If you are using a baguette, slice on a diagonal and place onto two cookie sheets. Place the brie and the sliced baguettes into the oven at 375 degrees for about 10 minutes or until cheese is bubbling and the bread is toasted. 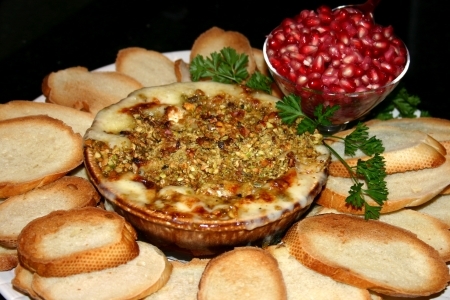 While cheese and bread are baking remove seeds form the pomegranate and place into a decorative dish for presentation. Once cheese is bubbly and bread has toasted, remove from the oven and arrange on a decorative large serving dish and enjoy! Try étoile Rosé Domaine Chandon (California), Wente Vineyards Morning Fog Chardonnay (Livermore Valley), Oyster Bay Chardonnay(New Zealand), Bogle Vineyards Chardonnay (California) Samuel Adams® Cranberry Lambic (Boston MA) or Fat Tire New Belgium Amber Ale.